It is back to school time, and along with that comes the push to vaccinate all school children. However, vaccines carry great risks and dangers. The U.S. government pays out millions of dollars to compensate vaccine injuries and deaths  each year. We reported just this week about the tragic sudden death of a 12-year-old girl  in Waukesha, Wisconsin, who died just hours after a Gardasil vaccine. As a parent, you need to research both sides of the vaccine debate so you can make an informed decision. 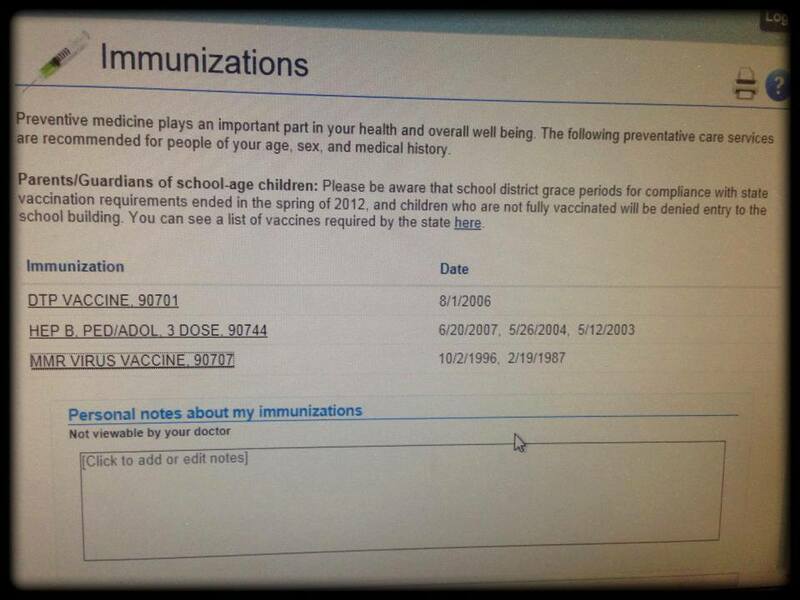 You may be told that your child cannot attend school if they are not vaccinated, but this is not true. In spite of efforts of the Pro-Pharma lobby to take away parental choice when it comes to vaccines, all 50 U.S. states still offer vaccine exemptions. However, school officials and pediatricians who are pro-vaccine may either withhold this information from you, or even lie outright  about it. The decision as to whether or not your child should receive any specific vaccine is a serious matter, so take some time to research each vaccine required for your child and know the risks. Then understand your state’s laws when it comes to vaccine exemptions. 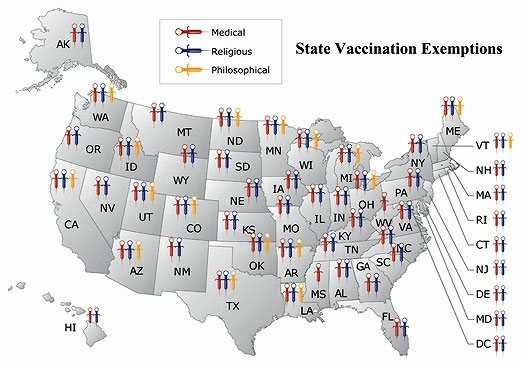 Exemptions from school-required vaccines exist for medical, religious, or philosophical objections, depending on your state’s law. Every state provides at least a medical exemption. Go to the National Vaccine Information Center’s website  and check the requirements for your state. What if I Cannot Get a Vaccine Exemption for my Child? Even though exemptions exist for all 50 states, if only medical exemptions exist, you will probably need to get a doctor to approve your medical exemption. So what do you do if you cannot get a medical exemption and there are no other options for exemptions in your particular state? Consider homeschooling. 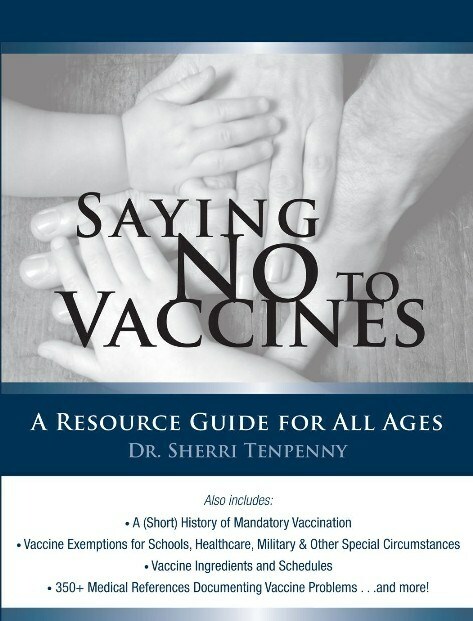 Many parents are making the decision to keep their children home and educate them outside of school systems that do not reflect their values on vaccines, freedom to make one’s own health choices for their children, and many other issues. Homeschooling is a growing movement across the United States, and many home-educated students are earning scholarships to the nation’s top universities and military academies. The Home School Legal Defense Association  provides legal counsel and representation to those who choose to home educate, and they are increasingly representing homeschooling families in medical freedom issues. Unfortunately, some people have very strong beliefs in vaccines, and believe that every child should be vaccinated no matter what the parents believe. Some of these people are doctors, government officials, and school administrators. They do not believe you have the right to make these important health decisions for yourself, even if the law permits it. Megan  of LivingWhole.org  recently reported the story of how one local branch of the Missouri Health Department was telling parents religious exemptions for vaccines were no longer available, when they actually were. Right away I smelled a rat. You see, Missouri requires children who attend school to be vaccinated but they also allow both religious and medical exemptions, which requires that a parent go to their local health department to pick up this exemption card to keep on file at their child’s school. I wasn’t aware that Missouri had abolished their religious exemption. If they had, I am sure I would have heard about it on the news. So, I stayed up all night stewing over it and set my alarm for 8 a.m. so I could call the “health department in question” and press them on this issue. When the phone rang a pleasant lady answered. I informed her that Missouri law allows one to opt out of vaccinations by filling out a religious exemption card from the health department and I asked if I could pick up a card. She quickly told me that the “state” said they were no longer allowed to pass out religious exemption cards. After questioning her further she finally suggested I drive a few hours to the health department located in the state capital and maybe they could give me one. Really? There’s new legislation that requires a parent who wants to opt out of vaccinations for religious reasons to drive six or more hours round-trip to get this little card…a little card that the state government’s health website says health departments have on hand? When I asked her to give me the name and contact information of the person who made this decision she told me to call the health department in Jefferson City (the state capital). I’m guessing she didn’t think I would actually call, but I did. I got on the phone with the Jefferson City Health Department, and ask them what I needed to do to get a religious exemption. They were very nice and respectful of my parental rights and told me I just needed to come in and get an exemption card. Really? That’s it? I said. I explained that I was a few hours away and told them what the lady from the local health department had been telling families in the area. I was informed that there was no such requirement that health departments stop passing out religious exemption cards and that I should contact my local health department and tell them to order more. I called the local health department back and finally got transferred to someone in charge of their immunization side of things. She gave me the same story, that the state told them they can’t pass out religious exemption cards anymore. And then I informed her that I had contacted the state and this was not the case. I asked her for the person’s contact information who had supposedly told her this and her story changed again. This time, they had run out of religious exemption cards. “We’ve had these forms for 20 years. Rarely do people ask for them. We ran out. We are for vaccinations,” she said. Are you kidding me? You are the local H-E-A-L-T-H Department who serves…the health needs of the locals! No, you cannot get a medical or religious exemption card at the library. I then offered to call the state health department for her and contact members of the local health board and run her thoughts past them. I told her that I was going to call the state and make sure the local health department was rush shipped a batch of religious exemption cards. Then, I told her I would be following up to make sure she received them. 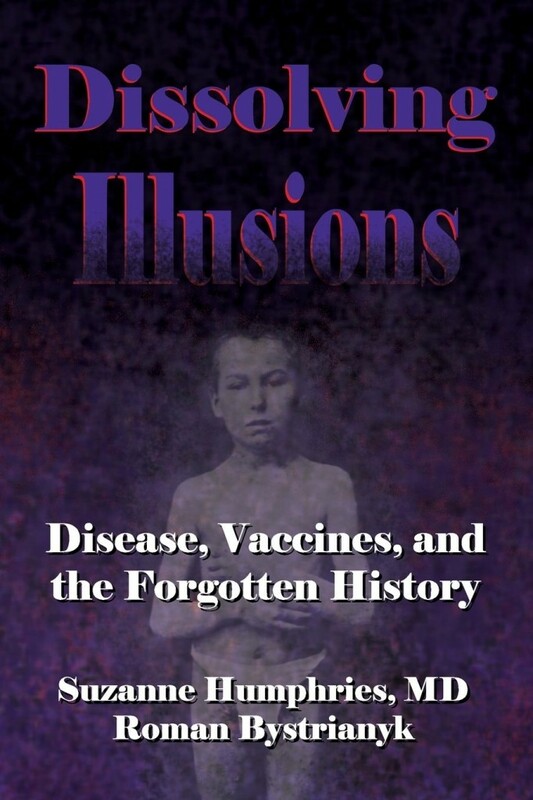 And finally, I decided to call the health department board so that they could be apprised that the local health department was misleading individuals into believing their was no vaccine exemption, lying, and not providing the information on vaccination exemptions that the state government assures they will have on hand. You would think this event is a rare occurrence, but it’s not. Just last year I ran into the same issue as the mother above when I tried to obtain a medical exemption card from a different health department in a different state. I had to call the state government, the U.S embassy, an immigration doctor, and the CDC before I was told the exemption card I needed was in fact…at the health department…who I had already questioned several times. With that being said, individuals and health departments are trying to find (illegal) and strategic ways of infringing upon your vaccination exemptions. Religious exemptions often require that you pick up a card from the health department, but the health departments are telling parents the “state” is not allowing them to pass them out anymore (which is false), and giving people the impression that no religious exemption exists…or telling them they have to drive a few hours to the state capital to get one. They are banking on the fact that you do not have a brain, and that the “hassles” they are imposing will encourage parents to just give up and vaccinate their kids. You can make a difference! 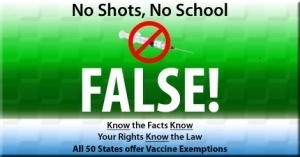 Know your rights, know the law, do your own research on vaccines. No shots, no school, not true!